Helps: strengthen your immune system, improve vitality, slowing down aging, improve cognition/temper, optimal relaxation (muscle and nerve cells). Great for busy/stressed/sporty people).  Price per package of 120 tablets, free shipping within the Netherlands. Optinerve contains magnesium glycinate with excellent absorption in your blood and cells. Of other supplements with for example magnesiumoxide only 0-4% of magnesium can be absorbed and used. The rest leaves your body unused. Optinerve is the best quality for the lowest price (non-profit). Magnesium deficiency can damage the central nerve system, consequences can be depression, anxiety, ADHD and migraine. About 325 enzymes depend on magnesium and regulate basic processes like energy metabolism and cell division. 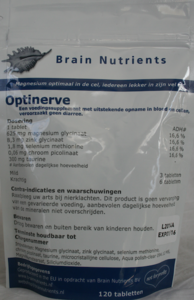 Brain Nutrients developed Optinerve, with magnesium magnesium glycinate, with excellent absorption of magnesium in blood and cells. It cannot cause diarrhea. Please note, of the best sold magnesium supplement, magnesiumoxide, only 4% or less can be absorbed by your cells. A lot of magnesium supplements are sold - in other (web)shops - with other magnesium compounds, like magnesium oxide, and have low bioavailability (only 0-4% is used and the rest leaves your body unused while urinating, see page 323 of this scientific paper). Other compounds like magnesium oxide and magnesium citrate can also cause diarrhea. Absorption in the bowls is key for making it bioavailable. That is why minerals should be given in a geletated form, like for example attached to an aminoacids. The molecular weigth of magnesium is 24.3 and of magnesium glycinate 172.4. So a magnesium glycinate of pure quality and good bioavailability cannot contain more than 14% magnesium of the total weight of that tablet. 1 tablet with 625 mg magnesium glycinate contains 16,6 % of the recommended daily dosage of magnesium for women (360 mg, for men 400 mg). A lot of other supplements only contain a fraction of this. Optinerve is the beste quality for the lowest price. Our foundation is totally non-profit. What is the function of magnesium in nerve, muscle and other cells? Magnesium allows a limited amount of calcium into the nerve cell, which is needed to create an electric impuls which travels via the central nerves system to the brain. If there is sufficient magnesium in the cell than this limited amount of calcium will leave the nerve cell after the electric impuls has been given. In case of a magnesium deficiency the calcium concentration remains at this elevated level. Calcium causes the contracting movement of muscles, while magnesium takes care of the relaxation. In case there is too much calcium and a lack of magnesium than the muscles stay in the contracting state. About 325 enzymes depend on magnesium and regulate basic processes like energy metabolism and cell division. Energy the most important enzym reaction is the creation of energy by activating adenosine triphosphate (ATP). This is the fundamental energy storage molecule of the body. So magnesium is needed to produce and to store energy in the body. Without magnesium there is no energy, no movement and no live. It is that fundamental. In addition, magnesium is a molecular stabilizer of ribonucleic acid (RNA), DNA, and ribosomes. Replenishing magnesium deficiency in neurons on average takes three to six months. For other cell types it takes less time. An intracellular magnesium deficiency can not be determined reliably in blood serum, which is still relatively unknown in the medical society. certain medicines (diuretics for high blood pressure, such as corticosteroids including Prednisone, contraceptives, and antibiotics like tetracycline, digitalis against some heart diseases asthma and bronchodilators, antacids, cytostatics , immunosuppressants , blood thinners). nutritional deficiencies: lack of green leafy vegetables , seeds and fruit and too much junk food, flavor enhancers, soft drinks, margarine and low-fat margarine, sugar, alcohol and nicotine. 120 tablets of 625 mg of magnesium glycinate, zinc glycinate 8.3 mg, selenium methionine 1.8 mg, 0.06 mg of chromium picolinate and 300 mg of taurine. When you don't have any complaints and you want to supplement you diet (as the content of minerals in our diet is depleted, you can consider to take 3 tablets as according to this UK study the content of magnesium is now at least 35% lower and zinc is 50% lower. Or you can eat more of the foods high in zinc and magnesium. When children don't have any complaints and (you) want to supplement their diet (as the content of minerals in our diet is depleted), you can consider to take half of the dosage mentioned above. Or you can eat more of the foods high in zinc and magnesium. Keep dry and out of reach of children.